Managing holiday rental properties is a totally different ball-game to managing permanent residential properties. It requires not only different skills, but also a different form of management, as the manager is dealing generally with a very diverse range of people in the tourist trade. As holiday property management is all we do, and as we have collectively over 50 years of holiday rentals experience between us, we do it well! Occupancy Rates: Caloundra Holiday Centre has consistently achieved for its landlords a good return for their holiday rental property. We Get Results. We know how to pro-actively market holiday rentals. We do not simply put a sandwich board out front hoping for a walk-in enquiry off the street. We find 90% of our holidaymakers before they get to Caloundra, or from our many repeat bookings. Internet: Whilst we have our own web site that you are now on, we are included in several others and most of the search engines will quickly find us, and we are constantly working to improve on this. 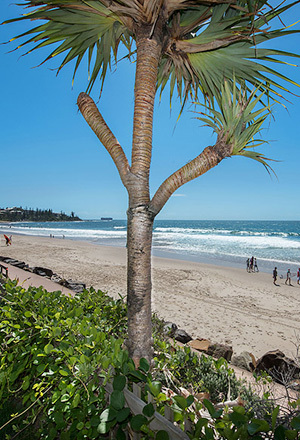 Our owners’ properties are featured in an attractive, professionally designed, 56-page booklet with colour photos of the properties plus a location map and other details such as conditions of letting, how to book, what to bring, what to do in Caloundra etc. These booklets are mailed out the same day to people who respond to our advertising, and many are sent out every day. Our regular advertising program encompasses newspapers throughout northern NSW and up to mid-Queensland, several member subscription magazines such as RACQ, NRMA AND RACV, Yellow Pages in a number of Queensland regions, and various special print features in other areas when featuring the Sunshine Coast or Caloundra. We provide and pay for a freecall phone number for all enquiries. We allocate a particular cleaner to each holiday property, so that the cleaner gets to know that property and its contents, and we are alerted to small things wearing out for instance, that perhaps only a regular cleaner would notice. Our cleaners take pride in their properties. When guests report equipment malfunction, or when breakages are observed, we will arrange local tradespeople to repair as economically as possible. Where necessary, we will employ licensed tradespeople. We buy and keep a stock of kettles, toasters, mops, mattress protectors, pillows, light bulbs, batteries etc, so that they are immediately available should a cleaner or guest require one. We offer free membership to our holiday guests once they have stayed with us for the third time. Our Frequent Stayers Club provides discounts and specials at many tourist attractions and restaurants, and helps to obtain the loyalty of our guests, thus obtaining valuable repeat business. For further details on fees and charges or any of our management services, you can email our Property Manager, Sarah Wilson, on pm@caloundraholidaycentre.com.au or phone (07) 5491 5444, and we can mail or email you our booklet entitled “Information for Landlords”. Under the “About Us” tab on our website you will find excerpts of some of the testimonials we have received from both landlords and guests. We do it professionally, and we’re proud of how well we do it. Why not join us?